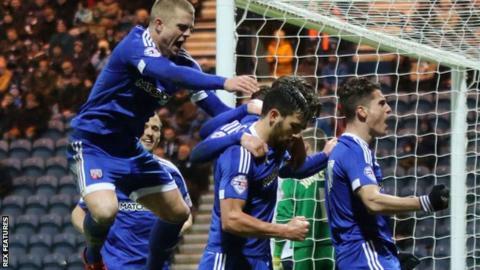 Brentford ended a four-game losing run with a first victory of 2016 against an in-form Preston North End. The Bees went ahead when a free-kick from Jake Bidwell sailed in, nicking off Greg Cunningham en route. Adam Reach levelled after Harlee Dean failed to deal with a Preston attack, but Alan Judge put the visitors back in front before half-time. And John Swift's late deflected shot from Maxime Colin's cut-back gave the Bees breathing space. Preston went into the game unbeaten in four, and this was their first home defeat since November. Visitors boss Dean Smith again left out defender James Tarkowski, who requested not to play in their previous game against Burnley. However, the former Oldham player was not missed as Brentford went ahead from Bidwell's smart free-kick, and then responded positively after Reach's equaliser. After Colin drew the anger of the crowd for a challenge on Cunningham that went unpunished, playmaker Judge compounded their frustration with a neatly-taken finish past Sam Johnstone. Tempers flared on the cusp of half-time, prompting referee David Webb to calm matters after Joe Garner's swinging arm earned him a booking, followed by another yellow shown to Paul Gallagher. Goalkeeper David Button proved his worth for Brentford as he palmed a Gallagher flick onto the bar after Paul Huntington hit the same woodwork with a header and Garner had the ball in the net, only for it to be ruled out for offside. Swift ensured the points for the Bees when he struck with 10 minutes remaining as Preston's fightback came to nothing. "Ultimately in the first half they were better with the ball, and if you allow a team like Brentford room, they're going to punish you. "We're disappointed with the goals we gave away, but ultimately we didn't cause them enough problems in the first half. "In the second half we laid siege to the Brentford goal, and in the big moments of the game we didn't take our opportunities. We've got to be more ruthless. "Even with the run we've been on we're not going to shout about what we can achieve - we'll just work hard to see what results we can get." "First half I thought we were really good and deserved to go in front. "Overall I'm really pleased with the performance, it's just a 10-minute period where we just need to get a bit better in showing composure. "The players have been in the Championship for a long time and they know there are physical challenges you have to meet. "I thought Garner had swung his arm and caught Sam Saunders. If he [the referee] has seen that then it's a red card, so I find it strange that it becomes a yellow card given the nature of the incident." Match ends, Preston North End 1, Brentford 3. Second Half ends, Preston North End 1, Brentford 3. Bailey Wright (Preston North End) wins a free kick in the attacking half. Attempt blocked. Adam Reach (Preston North End) left footed shot from outside the box is blocked. Adam Reach (Preston North End) wins a free kick in the attacking half. Substitution, Brentford. Nico Yennaris replaces John Swift. Offside, Preston North End. Greg Cunningham tries a through ball, but Callum Robinson is caught offside. Attempt saved. Jordan Hugill (Preston North End) header from the centre of the box is saved in the centre of the goal. Assisted by Adam Reach with a cross. Konstantin Kerschbaumer (Brentford) wins a free kick on the right wing. Goal! Preston North End 1, Brentford 3. John Swift (Brentford) right footed shot from the centre of the box to the high centre of the goal. Assisted by Maxime Colin. Substitution, Preston North End. Marnick Vermijl replaces Calum Woods. Attempt blocked. Daniel Johnson (Preston North End) right footed shot from the right side of the box is blocked. Greg Cunningham (Preston North End) is shown the yellow card for a bad foul. Konstantin Kerschbaumer (Brentford) wins a free kick in the defensive half. Attempt blocked. Joe Garner (Preston North End) left footed shot from outside the box is blocked. Attempt saved. Joe Garner (Preston North End) right footed shot from the centre of the box is saved in the top centre of the goal. Assisted by Daniel Johnson. Attempt missed. Daniel Johnson (Preston North End) left footed shot from outside the box misses to the right following a set piece situation. Offside, Preston North End. Paul Huntington tries a through ball, but Joe Garner is caught offside. Paul Huntington (Preston North End) hits the bar with a header from a difficult angle on the left. Assisted by Paul Gallagher with a cross. Corner, Preston North End. Conceded by Harlee Dean. Corner, Preston North End. Conceded by David Button. Attempt saved. Calum Woods (Preston North End) left footed shot from the right side of the box is saved in the top centre of the goal. Assisted by Callum Robinson. Josh McEachran (Brentford) wins a free kick in the attacking half.